Mothers Day is on the horizon. Having spent all of my adult life since the age of 17 living away from home, it has almost always been a long distance greeting to my own mother. A card sent in the post and bunch of flowers delivered by a stranger. 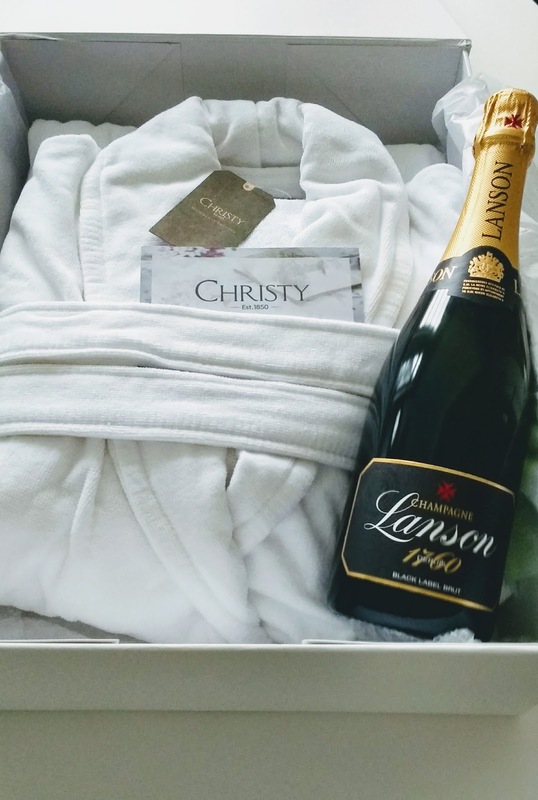 So this year, when I was approached by Christy to take part in their #MyGifToHer campaign, I was more than happy to take part. My mum will still be 250 miles away this year as she lives in Cheshire and I live in Devon but I hope the little extra gift she receives this year will bring a smile to her face. When we do get together, a drink or two are never far from hand so the gift of champagne was a lovely gesture. I took this photo of my mum a year or so ago on one of our rare trips away together. We went to see the Elvis Exhibition in London. We are off to London again this year but this time to see the Princess Diane clothing exhibition at Kensington Palace. I can’t wait, not only will it be a wonderful exhibition, but it gives us time together a mother and daughter to talk, walk, see the sights, drink and eat wonderful food (and maybe fit in a little shopping). Until then mum and I will raise a glass to each other thanks to one of the generous gifts from Christy of champagne and flowers ! 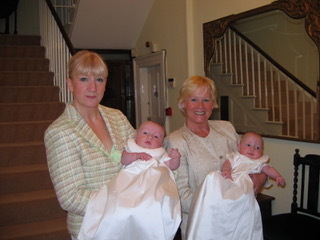 Unlike my mother who had me at the tender age of 17 years, I became a mum relatively late in life. I had my first son at the age of 33 and my twins at the age of 43. I never really understood what love was until I had my own children and although I have always appreciated what my mother went through all those years ago as a parent to three small children before she was 23, I truly now understand how very hard she worked to bring us up. At one stage she had three jobs, three small children including a severely handicapped son, no family support and having to deal with a very different attitude towards women back in the 1970s. My mother was definitely a major influence in my life, she taught me how to be strong, to stay true to my beliefs, to work hard and never give up and I hope I in turn, have passed those values onto my own children #HerGiftToMe . Luckily today, my mum has a life which is a world away from the difficult days of the 1970s. She is married to a wonderful man for the last 28 years who loves her unconditionally and together they have built a successful business and life together. We were both thrilled to receive these wonderful, personalised robes from Christy. 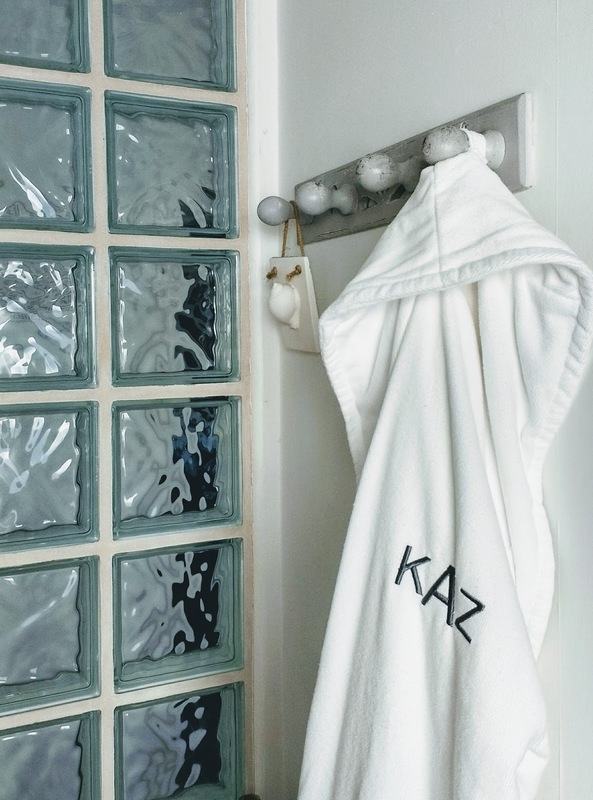 We could choose up to 3 initials but as I am called Karen and known as Kaz to members of my family and my mum is called Janet but known as Jan, we decided to go for shortened versions of our names instead. 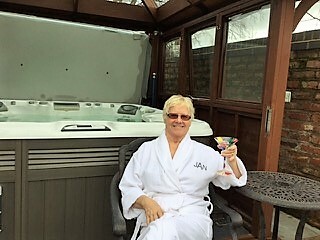 Doesn’t she look the part sitting beside her hot tub ! I am seriously camera shy these days so its just a photo of my lovely robe hanging in my bathroom. I have to say it is super soft and comfortable to wear and the boys think its hilarious to have my name emblazoned on my chest ! Many thanks to Christy for this lovely gift and great campaign. All views expressed are my own. What gorgeous robes, they look so soft and comfortable. And what lovely thoughts about your mother. It sounds as if you have a wonderful relationship.